Welcome to your virtual communication solution. Live Media pro-actively takes every step to guarantee your message is delivered with the best possible quality, in the timeliest fashion. We offer a concise variety of services, specifically designed to meet the needs of your communication strategy. We efficiently scale our solutions to match your project, enabling us to capture, store and broadcast your message, no matter how big or small, in a cost-effective manner. We stake our reputation on customer service excellence, achieved with skilled labour and cutting-edge technology. See our service offerings below, each backed my numerous client testimonials for your reference and peace of mind. Webcasting is an innovative, efficient and cost-saving way for people to collaborate, share information and exchange ideas. Think of it as a film crew, capturing and distributing your message to audiences all over the world, connected via the Internet. It delivers any combination of video, voice, presentation slides and interactive chat, all in an online portal customized with your corporate branding. Webcast events are delivered live, then posted as view-on-demand archives, for reference. Webcasts can be made available on a pay-per-view basis, enabling you to monetize your event. Live Media specializes in high quality webcasting across all sectors: corporate, government, not-for-profit, etc.. We offer attractive webcast package pricing for both live and view-on-demand webcasts. enables significant cost-savings associated with travel and accommodation. Trust Live Media to deliver your next webcast with amazing quality and outstanding customer service! Click here for more information about webcasting and webinars and examples. Live streaming , another name for webcasting, is a term frequently used to describe webcasts that contain video and audio only. Live streaming is also commonly used when describing pay-per-view HD webcasts. Live Media delivers high quality live streaming to your audience using state-of-the-art technology and a highly trained production team. We can easily provide you with a paywall, enabling you to monetize your event with pay-per-view access. Live Media video conferencing services enable multiple locations see and hear each other at the same time. We provide both standard definition (SD) and high definition (HD) services depending on your needs. Video conferencing is a great way to save money on time and travel, while offering the atmosphere of an in-person meeting. Our video conference service is scalable, enabling us to customize it to cost-effectively meet your needs. We can come to your location, or provide studio space for you and your team. We can set up and connect to your onsite AV services, or provide the entire AV solution as well. For multi-site collaboration, we can drop-ship equipment and teams to participating destination cities. Click here for more information on Video Conferencing and examples. 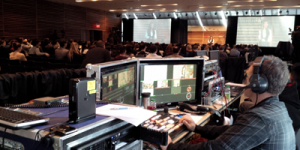 Live Media is the chosen service provider for conference recording and corporate film services. Let us record your meetings/conference sessions in high definition, with or without synchronized presentation slides, and deliver them as disc-based media for in-house use or host them online for view-on-demand access. When it comes to corporate film services, we deliver outstanding quality at very affordable prices. Let us film your presentation, board members, executive partners, etc., and provide you with a ‘perfect take’ that can be used again and again to deliver your corporate message flawlessy, on time, every time.